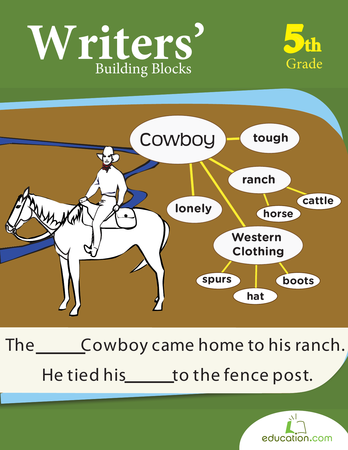 Students will study effective hooks and have the option to craft some hooks for their own writing. This writing lesson allows young authors to take random objects on exciting adventures. Students will enjoy telling stories from their objects' points of views, from exposition to resolution. 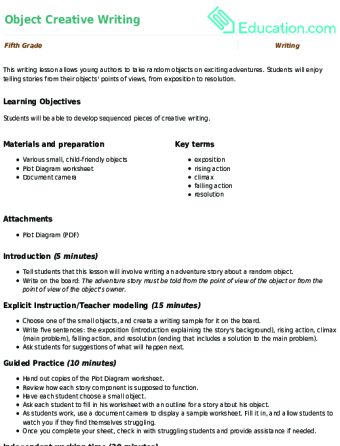 This activity will afford your fourth graders the chance to think about the claim they want to make in their literary essays and give them practice writing an intro paragraph. POW! 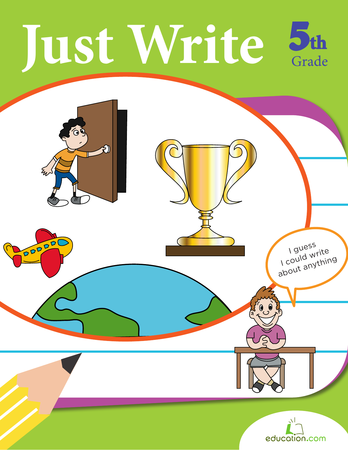 Knock writing practice out cold with this super series of creative writing sheets. 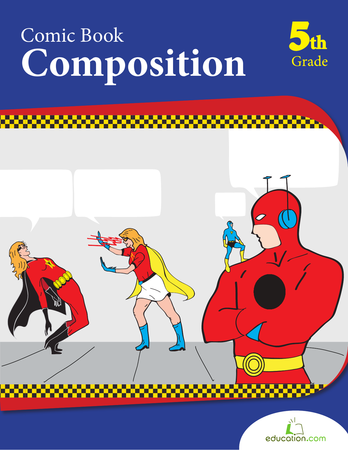 Your young superhero can flex his imagination by drafting his own comic strips. 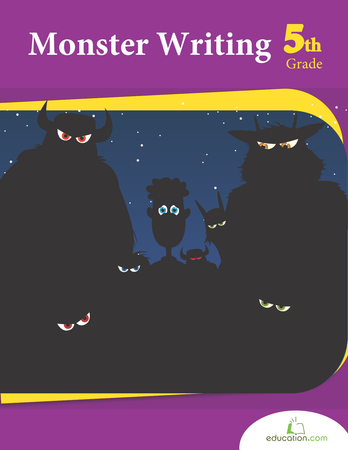 Have a monstrous amount of fun with this series of ghoulish writing activities. Get acquainted with famous monsters like Frankenstein, and write a few frightful stories of your own. Every name has a story behind it. This lesson allows students to share the story of their name with their classmates. Not only is it fun, it's ideal for establishing a respectful classroom community. Get your fifth grader to love writing with these creative writing prompts. Students will practice building stories, and can find inspiration from great authors such as Jack London or Mark Twain. 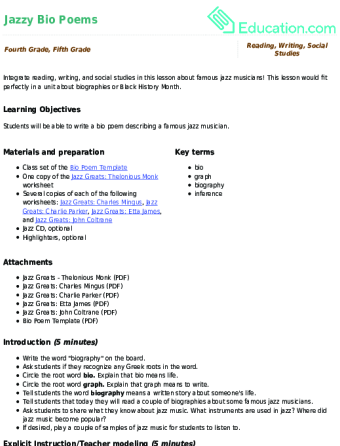 Integrate reading, writing, and social studies in this lesson about famous jazz musicians! This lesson would fit perfectly in a unit about biographies or Black History Month. Here is some basic training for every budding author. 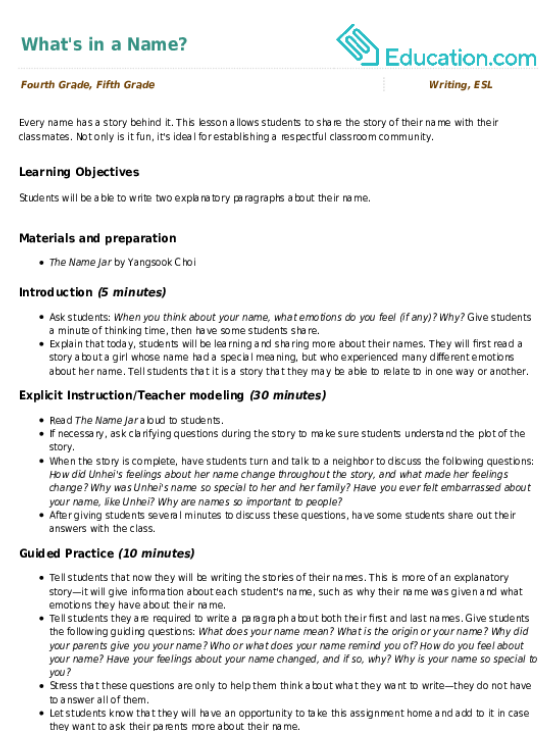 This series focuses on the pre-writing and organization stages of writing, including sequencing stories, making outlines and researching. Concept maps are versatile and useful for all subject areas. Use this concept map for word work, main idea and supporting details, or to map out ideas. This lesson walks students through the first few steps of crafting a personal narrative. 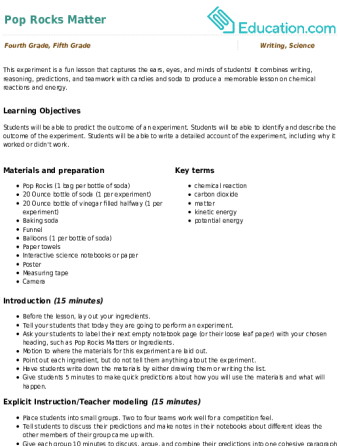 Writers will start by going through a process to select an idea to write about, then begin to craft a hook that invites readers into their story. 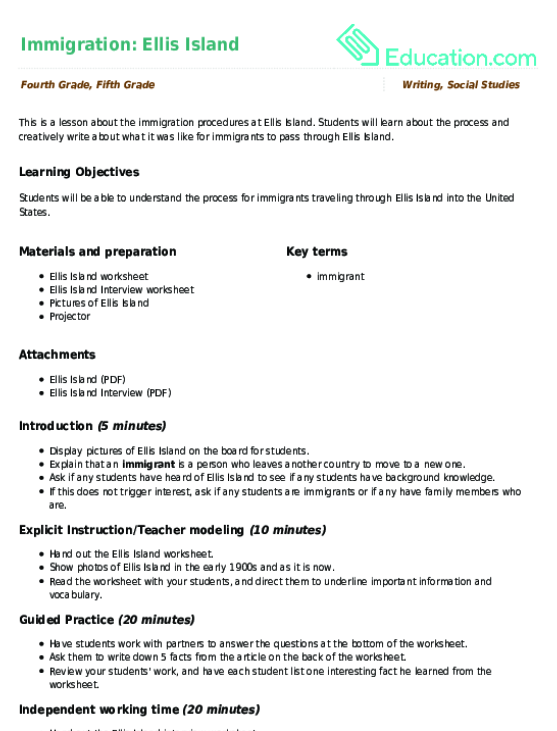 This is a lesson about the immigration procedures at Ellis Island. Students will learn about the process and creatively write about what it was like for immigrants to pass through Ellis Island. 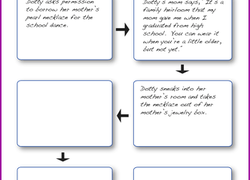 The first half of Dotty's story is here, but the second half is missing! Can your child come up with her own ending to complete the page? In this creative writing exercise, students will rewrite sentences to make them more interesting and practice adding vivid adjectives and adverbs to their writing. Get into the spirit of Halloween with a spooky info page, all about zombies! Your child will learn the ways of the walking dead as he hones his reading skills. 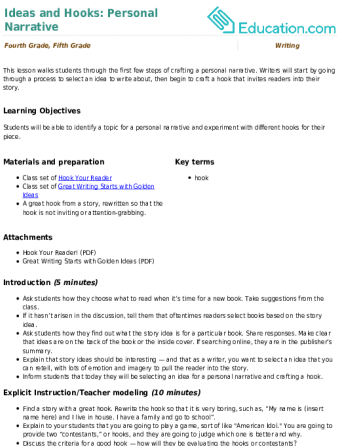 Use this worksheet as a tool to assist your young writers in selecting the perfect idea for their narrative. Put your students' imaginations to the test with this lesson on storytelling and creative writing. After reading some classic fairy tales, students will create their own using printed figures. 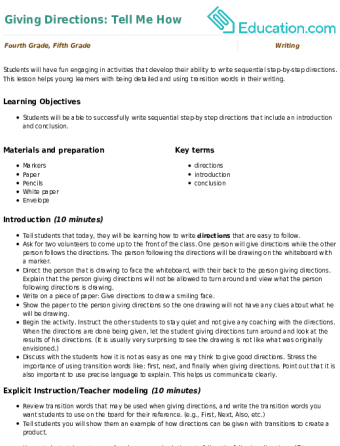 Use this picture prompt to provoke creativity in student writing. The flying, crowing, strutting figure of Peter Pan is known to kids of all ages, but how much do we really know? 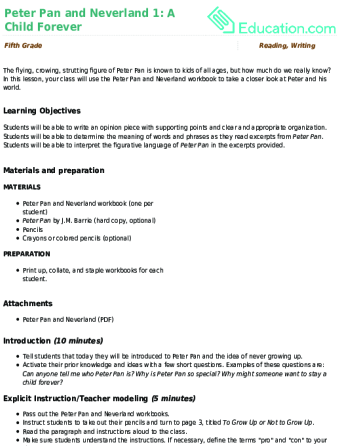 In this lesson, your class will use the Peter Pan and Neverland workbook to take a closer look at Peter and his world. This experiment is a fun lesson that captures the ears, eyes, and minds of students! It combines writing, reasoning, predictions, and teamwork with candies and soda to produce a memorable lesson on chemical reactions and energy.